When you look around on the internet, you can find a whole host of articles about the mystery of mass. For example there’s a Guardian piece by Ian Sample, who says the origin of mass is “one of the most intriguing mysteries of nature”. Or there’s Concepts of Mass by Max Jammer, who says ”the notion of mass, although fundamental to physics, is still shrouded in mystery”. There’s also the ATLAS article by Michael Chanowitz, who talks about uncovering “the deep mystery of the origin of mass”. There’s just one little problem with all that, and it’s this: Einstein solved the mystery of mass over a hundred years ago. The idea comes from the electroweak sector of the standard model, where the weak force is said to be mediated by massive vector bosons. They have to be massive because the force is short range. See the Wikipedia Higgs mechanism article where you can read that “according to Goldstone’s theorem, these bosons should be massless”. If they aren’t, the bosons aren’t gauge bosons, and the theory isn’t a gauge theory. And since electromagnetism is, the result would not be the electroweak theory. So a fix was needed, and it was provided by a number of contributors. They “discovered that when a gauge theory is combined with an additional field that spontaneously breaks the symmetry group, the gauge bosons can consistently acquire a nonzero mass”. Interestingly enough Peter Higgs’s original paper was rejected by Physics Letters in 1964 as not having any relevance to particle physics. So Higgs added a sentence at the end saying it implied “the existence of one or more new, massive scalar bosons”, then he submitted it to Physical Review Letters. It was called Broken Symmetries and the Masses of Gauge Bosons. It’s only a page and a half. You can read all about it in Higgs’s 2017 article on the prehistory of the Higgs boson. The trouble with all that is this: Einstein didn’t say the mass of a body was due to some interaction with some space-filling field. He said the mass of a body is a measure of its energy content, not something else. So somebody who says mass is something else, is saying Einstein was wrong. They’re also saying E=mc² is wrong. It isn’t. There is clearly something amiss somewhere. Sheldon Glashow didn’t call it “Weinberg’s toilet” for nothing. See Matthew Chalmer’s Particle Headache in the 12 November 2012 issue of New Scientist. That’s where you can read Guido Altarelli saying this: “The minimal standard model Higgs is like a fairy tale”. You can read more in Gian Francesco Giudice’s 2010 book A Zeptospace Odyssey. On page 173 he says this: “The most inappropriate name ever given to the Higgs boson is ‘The God particle’. The name gives the impression that the Higgs boson is the central particle of the Standard Model, governing its structure. But this is very far from the truth”. He also says “the Higgs sector is rather arbitrary, and its form is not dictated by any deep fundamental principle. For this reason its structure looks frightfully ad hoc”. Giudice tells us the mass of a body is the intrinsic energy of a body at rest, and tells us about E=mc². No problem there. The problem comes when he says “the Higgs mechanism accounts for about 1 per cent of the mass of ordinary matter, and for only 0.2 per cent of the mass of the universe. This is not nearly enough to justify the claim of explaining the origin of mass”. He also says the Higgs boson is “like the toilet of the Standard Model edifice”. I wonder if somebody is talking in code here, and I’m reminded of a house that had been used as a squat – the toilet was full of sh*t and it stank to high heaven. By the by, Giudice wrote an essay in 2017 on The Dawn of the Post-Naturalness Era, which featured an “an imaginary conversation with Guido Altarelli”. He’s also head of theory at CERN. Invariant mass is something you should forget about because the mass of a body varies with gravitational potential, which is why we have the mass deficit. Since intrinsic mass and proper mass are more of the same, you should forget about them too. Relativistic mass is another measure of energy – in Lev Okun’s 1989 Concepts of Mass you can read how Einstein cautioned against it. That leaves effective mass and rest mass. A photon exhibits an effective mass when you slow it down in glass. Let’s come back to effective mass later. For now, let’s focus on rest mass. When you see the word “mass” without qualification, what people usually mean is rest mass. That’s the mass of a body sitting there in front of you. It’s a measure of resistance to change-in-motion. A skateboard has a lot less mass than a car. It’s a whole lot easier to get a skateboard moving than it is to get a car moving. Then it’s a whole lot easier to stop the skateboard than it is to stop the car. Force equals mass times acceleration, and we know that the same force accelerates the skateboard aplenty but not the car. But Einstein said the mass of a body is a measure of its energy-content. So how does that work? Why is a body harder to push if it contains more energy? Like I said, it’s all very straightforward. That’s because of the wave nature of matter, and because most of the time, energy is kinetic energy, momentum is just another way of measuring it, and so is mass. Kinetic energy is looking at this in terms of stopping distance. Momentum is looking at it in terms of stopping time. We divide by c to convert from one to the other, because c is distance divided by time. You cannot remove that cannonball’s kinetic energy without removing its momentum, which is why kinetic energy and momentum are two aspects of the thing called energy-momentum. Like electricity and magnetism, they are two sides of the same coin. But if you’ve ever looked closely at a coin, you will notice that it doesn’t just have a flip side. It has an edge. That coin has a third side. So does energy-momentum, because for mass, you divide by c again. You can perhaps begin to appreciate this if I tell you I made a mistake with the cannonball scenario. Let’s rewind that. You’re still in space wearing a spacesuit, but that cannonball isn’t moving towards you at 10 metres per second. Instead the cannonball is at rest, and you’re moving towards it at 10 metres per second. It doesn’t have any kinetic energy or momentum. You turn on your backpack thrusters and scoop up that cannonball. Apply a constant force for as long as it takes to bring that cannonball up to 10 metres per second. You have given that cannonball some energy-momentum. Kinetic energy is looking at this in terms of distance covered, momentum is looking at it in terms of acceleration time. And the moot point is this: when we say it was the cannonball moving, we say it has kinetic energy and momentum. When we say it’s you moving, we say that the cannonball doesn’t have kinetic energy or momentum. All it has is its resistance to change-in-motion. All it has is mass. This is why Einstein talked about moving in uniform parallel translation with respect to the system. That’s what led him to the conclusion that matter is made of energy. In one situation you talk of kinetic energy, or momentum, or energy-momentum. In the other situation you talk of mass. The distinction depends on who’s you say is moving. For example in Compton scattering where a photon interacts with a free electron, the electron receives a “bump” and is sent recoiling off at an angle. Meanwhile the photon is deflected and its wavelength is increased. But imagine you’re that free electron, and you think it’s you moving instead of the photon. Instead of delivering a bump, the photon would feel like it was a bump. It would feel like the photon was something that had inertia instead of momentum. It would feel like the photon had mass. Of course when it comes to a photon in space, you would say it’s always moving at 299,792,458 m/s. This photon isn’t something you can slow down with your thrusters like the cannonball. Nor is it something you can speed up with your thrusters like the cannonball. It’s always moving at the speed of light. So it’s never at rest with respect to you. So rest mass doesn’t apply to a photon. That’s why the photon has no rest mass. Instead it has energy E=hc/λ and momentum p=h/λ, where h is Planck’s constant of action, c is the speed of light, and lambda λ is the photon wavelength. You cannot remove energy without removing momentum, so the photon has energy-momentum. And as per the Compton scattering example, the distinction between energy-momentum and inertia depends on who you say is moving. So how do you fix it so that the photon isn’t moving? You can’t accelerate to 299,792,458 m/s. You can’t chase a light beam and catch it up, as per Einstein’s thought experiment. That’s where Einstein said this: “if one were to pursue a light wave with the velocity of light, one would be confronted with a time-independent wave field. Such a thing doesn’t seem to exist, however”. However it does. Einstein didn’t know it in 1905, because the electron hadn’t been discovered for long. But you don’t pursue the light wave to be confronted with a time-independent wave field, you use another method. It sounds like a cheat, but it isn’t. Instead it’s simple. All you do is catch that photon in a mirror-box. The box is a body, and the mass of a body is a measure of its energy-content. So when you catch the massless photon in the mirror-box, it increases the mass of the system. The photon is still moving at the speed of light going around and around inside the box. But because its average location doesn’t change with respect to you, it’s effectively at rest with respect to you. You have effectively stopped the photon, and when you do so, its energy looks like inertia. And if that box is just the right size, the photon will look like a standing wave. Standing wave, standing field. It will look like a time-independent wave field. It will look like it’s standing still. Then when you open the box, what you’re holding in your hands is a radiating body that loses mass. The photon is out of the box in a flash. It departs at c from a standing start. But it wasn’t really a standing start. Because whilst the photon looked like a standing wave, it was always going around and around at c, all the time. Its path changed, that’s all. From a closed path to an open path. It all fits neatly with everything Einstein said about mass and energy. Apart from one little detail: there is no box. Because the electron is a photon in a box of its own making. This is what E=mc² is all about, and it applies to an electron just as much as it applies to a cannonball or a car. I’ve bought the T-shirt, and it isn’t wrong. Einstein even referred to body and electron on the same line. And Einstein wasn’t even the first to think along such lines. JJ Thomson, who discovered the electron in 1897, called it a corpuscle. A corpuscle is a small body, and again: the mass of a body is a measure of its energy-content. Are not gross bodies and light convertible into one another? Take a look at the conceptual development of Einstein’s mass-energy relationship by Wong Chee Leong and Yap Kueh Chin. Note their introduction. In 1704, over three hundred years ago, Sir Isaac Newton knew that gross bodies and light were convertible into one another. That’s what pair production and annihilation do. We’ve known about pair production and annihilation since 1932, the thick end of a hundred years. They convert light into matter, and vice versa. Simply by changing the wave path from an open path to a closed path, and vice versa. We start with two high-energy photons, we perform gamma-gamma pair production such that a photon interacts with a photon, and the result is an electron and a positron. Because each photon ends up interacting with itself, and stays interacting with itself, wrapped and trapped as a spin ½ particle. The result is mass, and all we did was convert linear momentum into angular momentum. To do this we had to convert some other linear momentum into angular momentum, because of conservation of angular momentum, and because those photons are the only tool in the box. Not only that, but they are the box. The electron has mass because a photon interacts with itself, not with something else. When it does, we don’t call it momentum any more, we call it mass. We don’t call it a photon any more. We call it an electron. We don’t call it light any more. We call it matter. That’s why we have the strange theory of light and matter. How absurd it gets. In Compton scattering some of the incident photon energy is converted into electron kinetic energy. The electron gets kicked aside and the photon is deflected. The photon changes direction and its wavelength increases because it loses energy. The electron is accelerated in the usual sense and the photon is decelerated in the vector sense. Do another Compton scatter on this self-same photon, and another and another ad infinitum, and in the limit there’s no photon left. You can take all the kinetic energy away from a fast-moving cannonball, and you’re still left with a cannonball. But it isn’t the same for a wave. When you take all the kinetic energy away from a wave in the surf, it just isn’t there any more. So the wave is energy. It’s the same for a photon. When you take all the kinetic energy away from a wave in space, it just isn’t there any more. So the photon is kinetic energy. Perform Compton scattering repeatedly with the self-same photon, and in the end it has been entirely converted into the kinetic energy of electrons. And yet, and yet: in pair production, you can make an electron and a positron out of a photon. So the electron is kinetic energy too. But now this kinetic energy is hidden. We call it mass-energy. Or potential energy. Or field energy. Only there’s angular momentum in this field, and a secret Poynting vector going around and around. Because of this, electrons have their dipole magnetic moment, and go round in circles, helixes, or spirals in a uniform magnetic field. Or drift in a non-uniform magnetic field. That’s why we have magnets. That’s why when you annihilate that electron with a positron you see 511 keV photons racing away at the speed of light. From a standing start. Because in atomic orbitals and everywhere else, electrons exist as standing waves. Standing wave, standing field. Standing waves that only look like they’re standing still. This is why the mass of a body is a measure of its energy content. If there is no energy content, there is no body. Photon energy or photon momentum is a measure of resistance to change-in-motion for a wave moving linearly at c. Electron mass is resistance to change-in-motion for a wave going around and around at c. That’s it. It’s as simple as that. And that’s all there is to it. Matter is made of energy and that’s the only ingredient. The rest mass of an electron is a measure of how much energy is in there going around and around in circles at c, going nowhere fast. The electron’s energy is 511 keV and its rest mass is 511 keV/c², only it isn’t really at rest. The electron’s kinetic energy is a measure of the extra energy that makes it move. It tells you how fast this energy that’s going nowhere fast, is going somewhere. But it can never go as fast as light because it is light, going around and around. Accelerating an electron can be likened to stretching a helical spring. Getting the electron moving is like deforming an open circle of spring steel into one turn of a helix. The energy required increases as we attempt to deform it further. As we accelerate more and more, the helix is effectively stretched straighter and straighter. But a photon travels at c, it can’t travel in a straight line at c and still be going around in circles at c. It would have to go faster than light to do that. And light doesn’t go faster than light. So matter can’t travel as fast as light. Matter can’t go faster than the light from which it’s made. It sounds as if there’s something wrong here. I am reminded of quantum electrodynamics, the first quantum field theory. It suffered from the “problem of infinities”, so much so that some authors say most workers in the field doubted its correctness, whilst others say physicists were so overwhelmed by the problems that they believed a conceptual change was needed. It didn’t happen. In their 1993 essay on the conceptual foundations and the philosophical aspects of renormalization theory, Tian Yu Cao and Silvan Schweber say “serious doubt has often been cast on the whole program”. They describe QED as a conceptually unstable theory, and say a stubborn historian might reject it. They also say renormalization “took the framework of QFT as given, and made no attempts to alter its foundations”. They go on to say that “what is hidden in the locality assumption is an acknowledgment of our ignorance of the structure of the electron”. Could a similar issue apply elsewhere? Yes. See asymptotic freedom and QCD – a historical perspective by David Gross dating from 2004. He says “by the 1950s the suspicion of field theory had deepened to the point that a powerful dogma emerged – that field theory was fundamentally wrong, especially in its application to the strong interactions”. And that “the feeling of most was that renormalization was a trick”, one that “simply swept the infinities under the rug”. He also said “quarks had not been seen, even when energies were achieved that were ten times the threshold for their production”. And that “the non-relativistic quark model simply did not make sense. The conclusion was that quarks were fictitious, mathematical devices”. That sounds interesting. Let’s investigate this. Let’s take a look at what the proton is, and what it is not. Hi John, another high quality article. You mentioned a photon in a box of its own making. That is one of ideas I have explored in a lot of detail I will write about it at an appropriate time. The thing that got me thinking in that direction in the first place was, in part, the lecture I did on Schroedinger’s wave equation. The solution is for an electron in a box. The box is actually a voltage potential box. If the localized energy of of the electron as a standing wave is creating its own box, then the actual situation is consistent with Schroedingers assumption. The wave equation solution in a finite sized box gives the electron energy levels constrained to specific levels. If voltage and mass / quantity of energy is equated with gravitational potential then given enough energy an electron can climb out of a local energy well, like an atom, and you have the photo electric effect. There is a lot more to explore in cubic geometry and it relation to, and transformation to spherical geometry. Incidentally, once you know that Schroedingers wave equation is solved for the electron in a box, it explains why the cat came in to illustrate macroscopic versus atomic level objects. If the electron is constrained in an atomic box and the cat is made of atoms, then it is ridiculous to consider the cat in the box. Sorry Andy, the above comment was in the spam folder. I can’t see why I’m afraid. I guess you repeated it. Utmost apologies for the inconvenience, but I was “under attack” a couple of weeks back, and set up a long list of words in the spam detector. I’ve since changed tack, so I hope the problem doesn’t recur. But please save your comment before posting just in case. Hi John, excellent work again. I was particularly interested in you description of a photon in a box of its own making as it ties in with many of my thoughts regarding cubic topology. However, I intend to write ore on that at another time. It does however remind me of my introductory lectures in semi-conductor physics. The solution to the Schroedinger wave equation is presented as the solution for an electron in a box. The box in question appears to be the voltage potential field of the atom which is a vertical sided potential forming a box that constrains the electron, and in which only certain energy levels are allowed due to the self-interference of wave trapped in the box. This fits with the idea of a standing wave electron that you have talked about, which is able to only take on quantised levels of energy from photons due to the energy level constaints of the box it is constrained within. Once you realise that the box the electron is in is an atomic size box, of a couple of nano-meters in side length, the story of Schroedinger’s cat can be seen to be ridiculous as it was supposedly, originally intended to be. Cats are made up of atoms as are all macroscopic objects. Therefore, the quantum box is inside the cat and it makes no sense for the cat to be inside the box. No matter how good probability maths is at describing the subatomic situation the out come is photons and electrons moving in very regular numbers between atoms to bring about the behaviour we observe at a macroscopic level. So macroscopic events and the probability description of the subatomic situation are incompatible. However, if you consider what is going on inside the atom as actual trapped waves of electromagnetic potential, rather that probability waves things make a lot more sense. I suspect that physics suffers from a psychological problem called “functional fixedness”. It is the inability to discriminate two interpretations for things that appear the same from one point of view. So, because the wave equation maths appear to look like probability expressions the mathematicians say, because we are using equations with the form of probability expressions, the real world situation they represent must relate to probability. They overlook the that the wave nature of electromagnetism can give rise to expressions of the same form. The same form but describing voltage potential distribution, not probability. Also, because they are looking for point particle solutions rather than considering that everything is just waves of electromagnetic potential of different lengths distributed in space and often wrapped back around on themselves in loops of helical electromagnetism. Waves, have a finite wavelength. Particles are infinitesimal mathematical concepts. If you view the particle as a description of the effect of the wave energy related to a point described by the wave centre in space, then you have two viewpoints that can be mutually compatible. Rather than a particle wave duality paradox. Keep up the good work. I look forward to your next blog. Thanks Andy. I’ve just added a paragraph to this one about Gian Francesco Giudice. There’s an interesting thing about the electron in the box. When you treat the electron itself as a photon in a box, and then move the box around and around a proton in little circles, the standing-wave photon that “fits in the box” has a longer wavelength. Hence the system features less kinetic energy. Hence negative binding energy, wherein the bound electron has less mass-energy than the free electron. 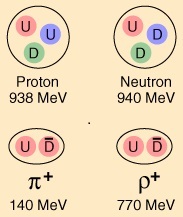 The proton is also affected of course, but not so much. I talk about the proton next.